Walt Disney World tickets: make dreams come true! Every kid (and big kid) dreams of going to Walt Disney World. 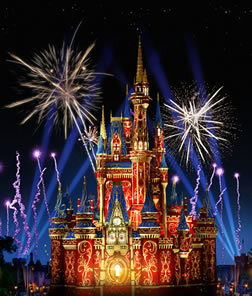 Isn’t it about time you made the dream a reality and got you and the family some Disney Florida park tickets? Thought so. With six magical parks – including two thrilling water parks – two dazzling neighbourhoods of night-time entertainment, and more than 20 unique hotels to choose from, it's easy to see why Walt Disney World Resort is one of the most beloved holiday destinations in the world. With Disney theme park tickets, you’ll have total access to every area of Walt Disney World Resort in Florida, including the Magic Kingdom Park, Disney’s Animal Kingdom Theme Park, Epcot, Disney’s Typhoon Lagoon Water Park and more. The littlest ones will love splashing away at Castaway Creek or exploring the gorilla-inhabited jungles of Gorilla Falls Exploration Trail. For those who can take the thrill, the world-famous Splash Mountain and Space Mountain at Magic Kingdom Park have a reputation for a reason; 5-storey drops and high-speed twists and turns are the name of the game – even the bravest among you will feel the adrenaline rush! The fun doesn’t stop after dark, either! By night, marvel at Rivers of Light, the immersive nighttime spectacular at Disney’s Animal Kingdom Theme Park, and fall in love with the magic of nature. Or how about heading to Pandora - The World of AVATAR, where the floating mountains and bioluminescent plants bring the world of the Na’vi to life? Of course, no day at Walt Disney World is complete without ooh-ing and aah-ing at the nightly IllumiNations. Fireworks never looked so good. But Walt Disney World isn’t all rides and log flumes — make sure you get to Disney’s Hollywood Studios to meet your favourite Disney characters in the flesh, be launched into space with Star Tours or catch Beauty and the Beast live on stage. Star Wars fans can enrol in Jedi training, too, and family bonding has never been as fun as it is rafting over waterfalls at Teamboat Springs. When you’re all tired out from rides and adventuring, there’s no better time to head to Sandy White Beach at Disney’s Typhoon Lagoon Water Park for a well-deserved chill. Kids can play in the Surf Pool, so, parents – this is your time to properly relax. Basically, Walt Disney World is your oyster, and a magical one at that. There’s no right way to do it. So long as you do it. Want to know more about Disney theme parks? You’re in luck. Check out the video below for some Walt Disney World insider knowledge. Buzz Lightyear's Space Ranger Spin: Fire lasers to defeat Zurg in this shooting-gallery game that puts you in the centre of a thrilling space battle. Under the Sea ~ Journey of the Little Mermaid: Enter Prince Eric’s castle, board a giant clamshell and rock out on this musical attraction. Mickey’s PhilharMagic: Disney magic blends with Disney music in this superb 3D adventure with Donald Duck. Seven Dwarfs Mine Train: Embark on an exhilarating journey inspired by the classic Disney film. Splash Mountain: Soak up a five-storey drop on this hugely popular attraction. Space Mountain: High speed rollercoaster adventure into the darkest part of the universe. Disney Festival of Fantasy Parade: See Mickey and friends in this dazzling parade as it marches its way into your hearts. Big Thunder Mountain Railroad: Take off on a runaway train through the Wild West! Pirates of the Caribbean: Set sail on a swashbuckling voyage to a long-forgotten time and place when pirates and privateers ruled the seas. 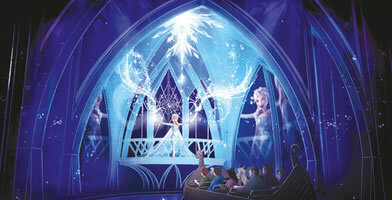 Gather round Cinderella Castle for an awe-inspiring show that’s sure to surprise and delight. Happily Ever After takes you on an unforgettable journey that captures the heart, humor and heroism of many favourite Disney animated films. The Boneyard*: An open-air play space,designed to look like a dinosaur dig site. FastPass+ not available. Gorilla Falls Exploration Trail*: Explore a lush tropical forest inhabited by gorillas, hippos and exotic birds. Finding Nemo - The Musical: Inspired by Disney∙Pixar’s Finding Nemo, this must-’sea’ adventure makes a splash with spectacular music and stunning theatrical puppetry. Expedition Everest: Beware the dreaded Yeti on this highspeed train trek through the Himalayan unknown. Kali River Rapids: Prepare to get wet - really wet! - on a wild, white-water Asian river ride. Kilimanjaro Safaris: Ride off in an open-air vehicle for a day or evening tour of a lush African savanna. Festival of the Lion King: Delight in this big-as-Broadway show celebrating Simba, the lion cub who would be king! 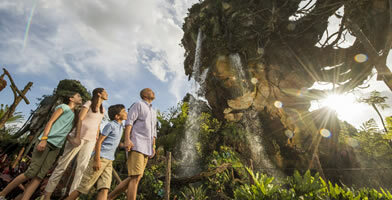 This awe-inspiring land will bring the world of AVATAR to life, featuring floating mountains, a nighttime jungle of bioluminescent plants and the amazing new attractions, AVATAR Flight of Passage and Na’vi River Journey. The Seas with Nemo & Friends: Inspired by Disney·Pixar’s Finding Nemo, see what happened to the brave little clown fish after the movie. Epcot Character Spot: Meet Mickey and his pals for photos and autographs, hugs and smiles. Turtle Talk with Crush: Visit Crush along with Dory and some of her friends from Disney·Pixar’s Finding Dory as they engage in real time Q&A with their human friends. Soarin’ Around the World: Soar high in the sky and feel the wind race across your face during a hand-gliding flight across the globe. Test Track: Presented by Chevrolet, design your own custom-concept vehicle and take it for a test drive! Mission: SPACE: Play your part in this thrilling astronaut-like experience. Disney Phineas and Ferb: Agent P's World Showcase Adventure: Thwart the diabolical Dr. Doofenshmirtz during a sleuth-worthy scavenger hunt around the World Showcase! IllumiNations: Reflections of Earth: Finish your day with this nightly spectacular of fireworks, lasers and high-energy soundtrack. Spaceship Earth: Take a journey through time from prehistoric man’s first words all the way to the 21st century’s cyber age. Set sail in Arendelle on this family attraction, and then stop by the Royal Sommerhus* for an encounter with the famed sisters. Lights, camera, action! Showbiz takes centre stage, but you’re the star. Walk down the red carpet into the heart of movie world, where glitz and glamour are in the spotlight, from thrilling attractions to on-stage live spectaculars and exciting backstage action. Are you ready for your close-ups? Meet favourite Disney Characters*: You’ll find them around almost every corner here, including Disney Junior pals, Mickey and Minnie, Buzz Lightyear and Woody. Beauty and the Beast - Live on Stage: Be swept into the romantic fairytale of the Beast who could only be saved by love in this lavish Broadway-style musical! Disney Junior - Live on Stage! with Sofia the First, plus friends Jake and the Never Land Pirates. Rock ‘n’ Roller Coaster Starring Aerosmith: Rocket from 0–60 in 2.8 seconds, to the beat of Aerosmith. Star Tours - The Adventures Continue†: Feel the power of the Force in this 3D simulated space flight launching you into the world of Star Wars. The Twilight Zone Tower of Terror™‡: Drop in for a terror-fying elevator ride. Toy Story Mania! 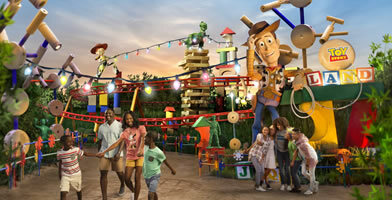 : Inspired by Disney·Pixar’s Toy Story films, this world of 3D games is hosted by Woody, Buzz and friends! Jedi Training: Trials of the Temple*: Kids aged 4–12 master the Force in this 20-minute interactive show. Then head to Star Wars Launch Bay, where you can view movie props, play games, screen videos and greet Star Wars heroes and villains. Step into Toy Story Land, where kids and grown-ups alike experience all-new adventures you’ll only find at Disney’s Hollywood Studios. In the so-much-larger-than-life setting of Andy’s backyard, Woody, Buzz, Jessie and the rest of the Toy Story gang invite you to join them. 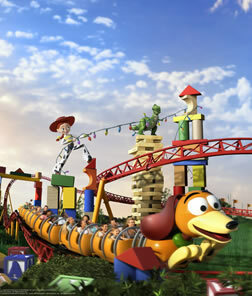 Andy’s assembled his awesome coaster kit and Slinky Dog is poised to take you on a wild journey. Hold on for an exhilarating ride that twists Slinky Dog’s coils around curves, hills, bridges and drops. It’s a crazy ride the whole family can enjoy together. The aliens have powered up their flying saucers to take you on a spin through space. Climb into a toy rocket and hang on as aliens lead the way on an interstellar romp set to an out-of-this-world beat. If you’re really lucky, you just might get ‘chosen’ by the claw. Fan favourite: Toy Story Mania! Take aim, and head over to Andy’s room where your Toy Story pals will help you blast your way through the 4D arcade. Fire at targets with everything from baseballs to cream pies — but you’d better be on your toes, because high-score bragging rights are on the line! † Star Tours® is a registered trademark of Disney/Lucasfilm, Ltd. © & ™ Lucasfilm Ltd.
‡ The Twilight Zone is a registered trademark of CBS, Inc. and is used with permission pursuant to a license from CBS, Inc. Age or height restrictions may apply to some attractions. As to Disney artwork and properties. ** On selected days only. Tinkertoy® is a registered trademark of Hasbro, Inc. Used with permission. 2018©Hasbro, Inc. All Rights Reserved. Disney’s Typhoon Lagoon Water Park* features the largest inland surfing lagoon in Florida. For tots, there’s a lot. For teens, thrills like you’ve never seen. Everyone can hang ten, or take five in this tropical paradise. Bay Slides: Twin body slides offer scaled-down thrills and spills suitable for even tiny tots. Ketchakiddee Creek: An area just for them with pintsize slides, fountains and waterfalls. Castaway Creek: Grab an inner tube and ease into the relaxing retreat of this continuous, flowing river that winds its way around all of Disney’s Typhoon Lagoon. Crush ‘n’ Gusher: The only white knuckle water coaster of its kind in Central Florida. Humunga Kowabunga: The screams you hear are your own as you plunge 65 metres down Mount Mayday. Mayday Falls: Brave the rapids — and the bumps — on the highest and longest waterslide at Disney’s Typhoon Lagoon. Gangplank Falls: Gather the gang for a raft ride in a giant inner-tube with room enough for four people. Surf pool: Experience the drama of a six-foot swell in this huge azure blue lagoon. Sandy White Beach: Slow the pace right down as you lie back and relax on the beautiful white shores surrounding the Surf Pool. With waves lapping and golden sun beaming down, these soft white sands are a haven from which to watch watery antics, or simply top up the tan. NEW! - Miss Adventure Falls: Board a treasure raft and hit the high seas for family fun during the longest ride in the history of the Disney Water Parks! * Subject to closure for refurbishment, as well as seasonal and weather closures. Age or height restrictions may apply to some attractions. Disney built a ski resort in Florida. And it melted... go figure. What remains is the very cool Disney’s Blizzard Beach Water Park*. From bunny slopes to black diamonds, it’s packed with downhill thrills and plenty of ways to chill, whether you’re a little squirt or making a big splash. Tike’s Peak: Their own kid-size version of the Park, complete with mini Mt Gushmore. Cross Country Creek: Drift lazily down a mountain through melting snow caves. Summit Plummet: Plunge at more than 55mph straight down one of the world’s tallest, fastest free-fall speed slides. Slush Gusher: Start training for ‘the big one’ on this 90ft long waterslide. Snow Stormers: Weave your way down the mountain on your stomach as you take on the snaking curves of one of 3 winding waterslides. Ski Patrol Training Camp: Big kids and preteens can challenge themselves or chill out in this activity-driven play area. Teamboat Springs: The family that rafts together, laughs together on this 365-metre raft ride over rushing waterfalls. Downhill Double Dipper: Race against your friends on these side-by-side waterslides. Melt-Away Bay: An oasis at the foot of Mt Gushmore, this one-acre wave pool is the perfect chill-out zone. Listen to the sound of the surf as gentle azure waves lap the shore, or grab an inner tube and bob merrily out at sea. DON'T MISS! - Toboggen Racers: Grab your mat, take your mark and get ready to go headfirst, belly down to the bottom of Mount Gushmore on a 250-foot-long slope with 3 exhilarating dips. Welcome to Disney Springs. Come savour the day as you enter this eclectic mix of boutiques, one-of-a-kind eateries and jaw-dropping entertainment. Our four fascinating neighbourhoods are filled with so much to discover - they’ll pull you from one to the next. Ease into the charming rustic vibe of this welcoming waterside district filled with unique boutique shops. The wharf-side eateries offer everything from artisanal cocktails crafted at the edge of your stage-side table to a sushi bar so fresh, it’s a cut above the rest. The Marketplace is one of the hippest Disney shopping experiences around. From a sophisticated art gallery to a candy store that’s just ‘goofy’, here you’ll find the largest collection of Disney merchandise in the US, from totally classic to truly unique. Welcome to a neighbourhood with a vibe all its own. Here, the air is mixed with the sound of applause for renowned shows and the tempting aromas of treats to be discovered. Daytime is filled with fun, but at night, it’ll ignite your senses and evoke your wild side. We are delighted to be able to offer this service Exclusively Free to Virgin Holidays guests who fly with Virgin Atlantic as part of your Disney holiday. It allows you to make the most of your last day in Orlando, giving you time to shop for those last-minute presents, or soak up some more Florida sunshine!